The life and the goal of Swami Prabhupada, the founder of ISKCON, who spread the glory of Sri Krishna all over the world with the Hare Krishna mantra, are inspiring to everyone. Janmastami is the birth day of Sri Krishna. (He was born at midnight on Janmastami.) September 7, 2004 was the 108th birth day of Swami Prabhupada, the founder of ISKCON (International Society for Krishna Consciousness), who spread the name of Krishna all over the world. (The number 108 is mystical according to the Hindu tradition.) This writer calls the day following Janmastami "Prabhupada Navami." The life of Swami Prabhupada is indeed inspiring for everyone. The steamer "Jaladuta" left Kolkata, and often sailing on a stormy sea, arrived 35 days later at the Boston port at 5 o'clock in the morning of September 17, 1965. It was to stay in Boston for some time before leaving for New York. A 69-year old Swami got out of the steamer and walked on American soil. "My dear Lord Krishna, You are so kind upon this useless soul, but I do not know why You have brought me here. Now You can do whatever You like with me." "Somehow or other, O Lord, You have brought me here to speak about You. Now, my Lord, it is up to You to make me a success or failure, as You like." "I have no devotion, nor do I have any knowledge, but I have strong faith in the holy name of Krishna. I have been designated as Bhaktivedanta, and now, if you like, You can fulfill the real purport of Bhaktivedanta." The Swami, who became famous all over the world as Prabhupada, had only eight dollars in his pocket! But in his heart was Sri Krishna Whose wife is Lakshmi, the Goddess of wealth. In only twelve years Swami Prabhupada did wonderful works in America and other countries. --With the help of his numerous disciples and devotees, he built 100 temples. --He wrote more than 60 books. They were translated in 30 languages. Hundreds of thousands of books were printed and sold. --He traveled around the world 14 times spreading the name of Krishna. What are the secrets of the incredible success of Swami Prabhupada? --Devotion to Krishna, and His grace. spread Krishna consciousness around the world. With the grace of Krishna he achieved incredible success in his mission. Swami Bhaktisiddhanta, the guru of Swami Prabhupada, had instructed him to spread devotion to Krishna in the Western world. Swami Prabhupada decided to make an heroic effort even if it cost him his life to fulfill the command of his guru. The blessings of his guru also played an important part in his success. --The clear purpose of life. Even children can easily chant the above sixteen-word mantra comprising of only three new words: Hare, Krishna, and Rama. Everyone, whether young or old, is attracted to the mantra. And when it is chanted by a group of devotees while dancing with music it captures the hearts and minds of all. Indeed, the key to the world wide success of Prabhupada is the Hare Krishna mantra. The personality of Krishna is so charming that He will attract anyone who meditates on Him with an open heart and mind. It is indeed exciting to think of Krishna, the Supreme Personality of Godhead. Look at the murtis or pictures of Radha and Krishna with loving attention. Keep looking. For Radha, Krishna is Her all. She is the form of pure devotion to Krishna. Bow your head at at Her Lotus Feet and pray for Her blessings, and the nectar of devotion to Krishna. The joy of that pure devotion is indescribable. Everyone can enjoy this infinite bliss. What is needed is to surrender your heart at the Lotus Feet of Radha Krishna. And then you will have darshan of Radha Krishna in your heart. Indeed, Prabhupada made it easy for everyone to love Krishna. also. But to realize these truths one must have pure love and devotion. The architecture of the newly built Krishna temples, and the murtis inside are indeed attractive. And above all, the books of Prabhupada which have reached the far corners of the world and many countries in many languages include spell binding pictures in multi-color created by his dedicated disciples and devotees. The Krishna art inspired by Prabhupada has also played an important role in spreading the Krishna consciousness around the world. stimulates one's devotion to Krishna. Thus the prasad is an important part of Krishna consciousness. Of course, it is also a secret of the incredible success of Prabhupada! 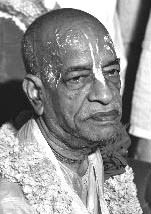 Prabhupada once humorously explained the significance of prasad. Along with other items he used to prepare "gulab jambu" (sweet balls) which was a favorite of his disciples. He called the sweet balls the "Bullets [of the guns] of ISKCON!" And he explained that they were to be used in winning the war against maya! Prabhupada once humbly said in New York: "I am a small person, but this message [of Krishna consciousness] is not small." Indeed, Prabhupada who spread the message of Krishna consciousness around the world was a great Swami. His life is an inspiration for everyone. Our millions of pranams (salutations) to Krishna conscious Swami Prabhupada.